We set and monitor practice standards and provide guidance to osteopaths to ensure that patients receive quality care. The Osteopathic Practice Standards set out the standards expected of osteopaths and include guidance to assist osteopaths in meeting these standards. The purpose of the standards is to ensure quality care for patients and to protect them from harm. For easy reference download the Osteopathic Practice Standards Pocket Guide, which contains the 37 standards that underpin osteopathic practice. The Osteopathic Practice Standards are also available to download in Welsh. Mae’r Safonau Ymarfer Osteopathig ar gael yn y Gymraeg. we set, we can provide advice and, where appropriate, guidance about making a formal complaint. These standards focus on the nature of the therapeutic relationship between osteopath and patient, which is built on trust and confidence. Osteopaths must communicate effectively with patients in order to establish and maintain an ethical relationship. These standards concern the the relevant knowledge and skills an osteopath must have in order to function as a primary healthcare professional. The aim of these standards is to ensure that osteopaths deliver high-quality, safe, ethical and effective healthcare through evaluation and considered treatment approaches, which are clearly explained to the patient. Osteopaths must deliver safe and ethical healthcare by interacting with professional colleagues and patients in a respectful and timely manner and these standards set out the professional behaviour required of osteopaths. Standard D7, in the Professionalism section, says ‘Be open and honest when dealing with patients and colleagues and respond quickly to complaints.’ In a joint statement published in 2014 the GOsC and other healthcare regulators made it clear that they expect health professionals to be proactive in telling patients when something has gone wrong, rather than simply responding to complaints. You can find out more on our Duty of candour page. 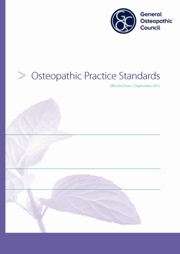 We have published updated Osteopathic Practice Standards. The updated standards will take effect from 1 September 2019 but you can familiarise yourself with them in the meantime. The statement of changes provides a summary of revisions made to the current Osteopathic Practice Standards and incorporated into the updated Osteopathic Practice Standards, whch will take effect from 1 September 2019.